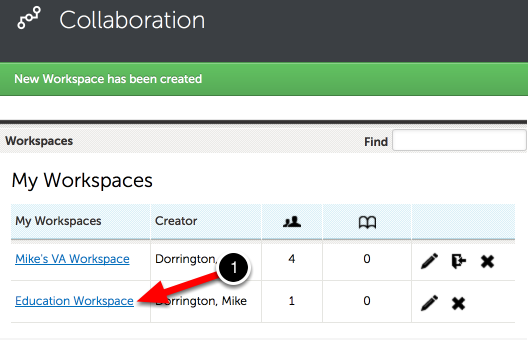 Collaborative workspaces have their own portfolios that are accessible from the My Coursework screen as well as the Collaboration screen. However, in order to add a new portfolio that will be accessible to other members of the workspace, you must create a portfolio within the Workspace. This lesson will walk you through the process of creating a new portfolio in your Collaborative Workspace. Before creating a new portfolio, it is important that you have gathered all of the necessary information. Please ensure that you know which Table of Contents to select (which will provide the structure for your portfolio). If you are uncertain, please contact your instructor or local Chalk & Wire Administrator. 2. 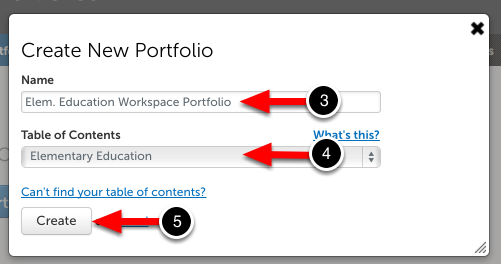 Click on the Workspace Portfolios tab. 3. Click on the Create New Portfolio button. 3. Enter a Name for the portfolio. 4. Select a Table of Contents from the drop-down menu. If you are unable to locate the correct Table of Contents, click on the Can't find your table of contents? link. 7. Click Return to Workspace.